Prayer of the Dragon by Eliot Pattison, a Mysterious Review. Review: Eliot Pattison's fifth mystery to feature exiled investigator Shan Tao Yun, Prayer of the Dragon, is a mesmerizing tale of murder and deception, set in a remote region of Tibet. Fearful of drawing the attention of the official government in Beijing, Shan, a former government official who was once condemned to a Tibetan gulag but "allowed" to escape, is summoned to Drango, a small village at the base of the sacred Sleeping Dragon Mountain in Tibet, to investigate a series of grisly murders in which the victims' hands had been severed and removed from the scene of the crime. A man who had descended from the mountain covered in blood is the only suspect, but he is a foreigner: a Navajo from America. Blackmailed into finding the killer, Shan must also discover the motive for the murders. But the secrets of Sleeping Dragon Mountain are not easily learned and danger precedes Shan's every step. 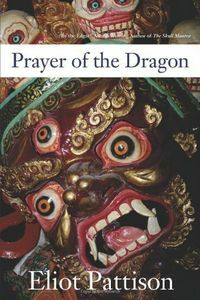 One just doesn't read Prayer of the Dragon; one participates with Shan on his extraordinary quest for the truth. This is not a book to be read quickly. The atmospheric setting and crisply written narrative are meant to be savored. It is relatively long at over 350 pages, but there are few unnecessary passages. And the plot is fairly complex. At some point, however, the mystery of the murders becomes somewhat secondary, replaced by the wonder and awe of the mountain and its centuries of history. Shan's journey is fraught with peril along the Bon kora, the ancient path to the summit, and the certainty of the unknown affects both Shan and the reader. As great as the mystery of the killer's identity was the mystery of the victims'. [Shan's friend] Lokesh would insist that the spirits of the dead, like those of all murdered men, still lurked nearby. Shan found himself scanning the darkened slope. He would have welcomed a conversation with a ghost. His first question would be the one that had gnawed at him since visiting the death site the first time, when he'd seen the lightning snake and a portion of a little wooden figure. Why were these Tibetan things being done in non-Tibetan ways? Much later, when Shan is heading out, he tells a companion, "Someone once asked Lokesh what I do. He told the man I am a confessor of ghosts. It's the best description I have ever heard. In my experience the only people who can be relied upon always to tell the truth are the dead." There are many intriguing aspects of the story that add complexity to the plot. One is the potential historical link between the Navajo and the Bon and how it plays into the motivation of some of the characters. Another is the political climate of Tibet and the conflict between the official government in Beijing and the officially unofficial government of Tibetan villages. Yet a third is in the characters themselves which are wonderfully and uniquely drawn and frequently behave in not quite expected ways. The climax has a bit of an Indiana Jones feel to it but the final chapter is a contextually fitting and appropriate conclusion to a most remarkable book. Prayer of the Dragon is a captivating experience. It is one of the year's best mysteries. Acknowledgment: Soho Press provided an ARC of Prayer of the Dragon for this review.